Summertime and the living is easy! Summer, like each of the seasons, brings a distinct personality of light, fire, heat, and intensity. Depending on your individual mind and body constitution (dosha), summer may aggravate your innate tendencies or increase your sense of harmony. Whether you relish in the heat of summer or prefer to be indoors, having a seasonal diet and lifestyle can help you improve your state of balance throughout the seasons. One of the fundamental principles of Ayurveda is that our diet, routines, habits, and exercise should change with the seasons. Through regularly adjusting our lifestyle to accommodate for each season we can have a healthy microbiome and have optimal health year round. When we adjust our diet and lifestyle to work in with the rhythm of the seasons, health-promoting digestive microbes dramatically change. These microbes support a balanced immunity, digestion, mood, energy, blood sugar, a healthy weight, and a deep sleep. It can perhaps seem daunting at first to try to live seasonally, but it will come naturally when we listen to our innate nature of being. Often as modern people we want to be eating ice-cream on cold winter nights or hot spicy foods on a summer day. We then notice imbalances from colds, flus, anger, rashes, etc. and wonder what could be going on. One of the main ways to tap into seasonal eating is by following Prajnaparadha. Prajnaparadha is a Sanskrit word that means “crimes against wisdom.” It’s a central concept in yoga and Ayurveda because it’s understood that doing things we know we shouldn’t is the cause of most diseases and other sufferings. When we tap into the nature of what is around us from what fruits and vegetables are available in that season to what types of routines give you more energy depending on the temperature, we can begin to live in harmony with the seasons. If you know your individual constitution, you can take even more steps to harmonize yourself to the change of summer. Sensitivity to heat, irritability, impatience, skin rashes, occasional acid reflux, occasional stomach ulcers, lethargy, occasional heartburn, sarcasm, boils, acne, low blood sugar, and difficulty falling asleep. If you experience these symptoms, make an Ayurvedic consultation, and follow the guidelines for summer! Summer is classified in Ayurveda as Pitta season, with the main elements of fire and water at play. The heat, the long days with bright sun, and the sharp intensity define the Pitta season. Pitta is understood as the digestive fire or metabolism, as it is hot and demands high amounts of energy. It demands the energy-producing properties of vegetables, fruits, and other carbs. Carbohydrates are a fast, efficient source of fuel, and the body demands fruits and vegetables to meet these needs. In a seasonal cycle, the majority of your diet should come from these carbs. Raw vegetables such as cucumbers, bell peppers, broccoli, and tomatoes are wonderful to incorporate into your summer diet since they are free of fats and contain cooling properties. 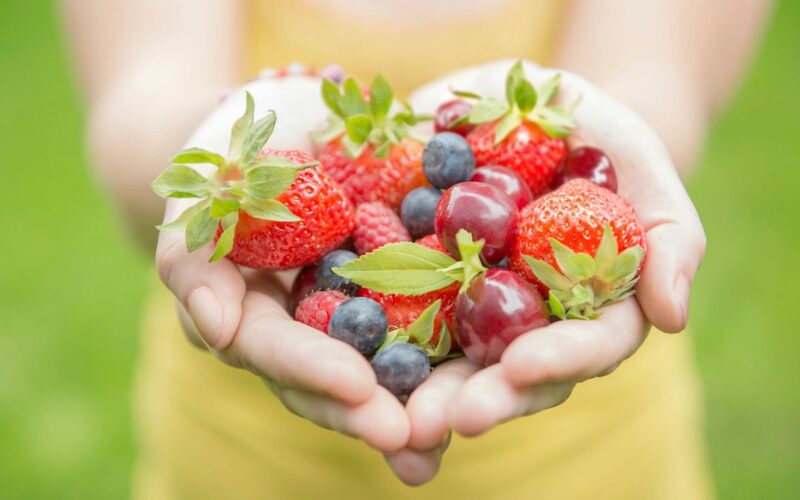 Summertime is best to favor sweet foods to combat the internal fire, so it is best to eat fruits such as berries and cherries. A high-carb, high-sugar diet is naturally available in summertime and could potentially lead to low energy. To counter balance the possibility for low blood sugar (hypoglcemia) and energy problems (fatigue) have 70% of your diet from carbs and 30% from protein and fat. Eat more foods that are cooling in nature (such as mint, coconut, and fruit). Favor foods that are sweet, bitter, and astringent. Salads, steamed vegetables, and coconut oil are great. Eat less foods that create heat like spicy, sour, or salty foods. Coffee, salsa, chips, and other spicy foods should be reduced. Make sure to stay hydrated! Room temperature water with cucumber or coconut water can help you keep cool. The best foods for summer are locally grown and organically produced. Check your local farmers market for local produce. Vegetables: Broccoli, artichokes, cauliflower, cucumbers, beet greens, okra, asparagus, celery, cilantro, fennel, zucchini, kale, lettuce, tomatoes, and bell peppers. Fruit: Mangoes, melons, peaches, berries, grapes, guavas, persimmons, plums, apples, apricots, blueberries, cherries, pears and all melons. Grains: Barley, oat, rice, rye, and wheat. Legumes: Garbanzo, fava, mungs, split pea, bean sprouts, lentils, and tofu. Nuts and seeds: Sunflower, pumpkin, coconut, and flax. Dairy: Ghee, milk, and rice/soy milk. Meat: Meat should be reduced in summer and eaten in moderation. Chicken, freshwater fish, and turkey are lighter for the season. Oils: Coconut oil, olive, avocado, and soy. Herbs: Aloe, cumin, coriander, asafoetida, peppermint, fennel, anise, and saffron. Tea: Hibiscus, mint, dandelion, chamomile, and chicory.